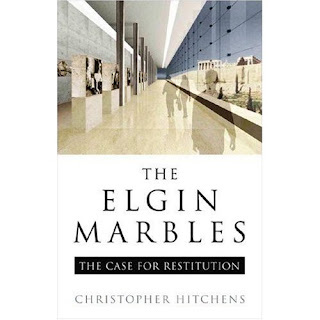 The Parthenon Marbles: "the opportunist acquisition of the hastily-chiseled plunder"
A new edition of Christopher Hitchens' "advocacy" for the reunification of the Parthenon marbles has appeared. (It was originally published as The Elgin Marbles: should they be returned to Greece? .) This includes a new introduction by Hitchens as well as a preface by Nadine Gordimer that anticipates "an honourable return of the missing parts from the British Museum". Charalambos Bouras has contributed an essay "The Restitution Works on the Acropolis Monuments". This includes discussion of the Erechtheion, the Propylaia and the temple of Athena Nike.